Caulk and chink for your log home. Which one is right for you? The rule of thumb is if the gap between log courses is ¾ of an inch or less, you should use caulk. If it is larger than ¾ of an inch, you should use chink. 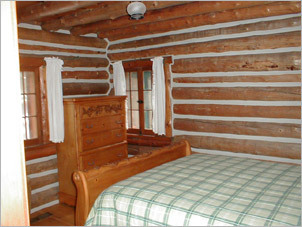 These products are designed to withstand the movement of your log home in these applications. Grip Strip backer rod should be used to fill the larger openings. This makes a flat surface and allows the chink to stretch like a rubber band when applied properly. A properly caulked or chinked log home will be much more efficient to heat and cool. Gaps around windows, doors, between log courses and in the corners can rob your log home of comfort. Improperly installed or failing caulk and chink is also one of the primary causes for log rot. While it may seem like an easy solution, we do NOT recommend filling the checks or “cracks” in the logs with caulk. Over time, with the log movement, the caulk will fail along these checks and leave a hairline crack between the wood and caulk, allowing water to seep into the checks. Since the majority of the opening has been filled, the water cannot dry out, causing log rot to occur. There are times when you must fill these checks, but they should be kept to a minimum. If there is a check that runs into a window, door or corner, that is allowing the wind, water or bugs to enter the interior of your home; you will have to fill them. You should plan on inspecting these, spring and fall, and repair if needed. We recommend applying a small bead of Shell Guard to these checks, every one to two years instead. This keeps the check open to “breathe” as nature intended, and will stop any log rot that may want to form.